You might not have noticed yet, but all around you competitors are waking up to the talent found in this often overlooked breed. Turns out the best harness racing horse in the world is also a superb ridden sport horse. This article will present a brief outline of the Standardbred to give you a introduction to its range of talents and its suitability for your sport horse projects. The full history of this fascinating breed and its history as a RIDDEN sport horse, including its unsurpassed talent for jumping, as well as its benefit for the sport horse breeder of today will be provided in detail in Standardbred Sport Horses (now available). Just like our other sport breeds in this country, the Standardbred is based on the genetics of our original sport horse breed: the American Running Horse. The American Running Horse is a cousin to the English Thoroughbred as both came from the same root stock: the Irish Hobby, Scottish Galloway and English Running Horse; and here is the curious part--their development was simultaneous, that is both became a set breed with performance standards in place by the mid-1600s. This means all three of America's racehorse breeds: Quarter Horse, American Thoroughbred and the Standardbred, as well as the English Thoroughbred are siblings, plus the Irish breeds of Connemara Pony and Irish Draught arise from the same base stock as well--and before you dismiss the idea, realize the DNA studies back this history up. Our Colonial Running Horse was originally a gaited race-saddle horse with tremendous sprint speed at both the pace and the gallop, with great stamina as well it could easily run four-mile heat races several times a day. With contrast to all this athletic ability was its sweet gentle temperament which made it a favorite mount for everyone--they were the preferred saddle horse of the day. As you can see demonstrated in the photo above the Standardbred has retained this lovely disposition. The Standardbred only came into being in 1879 when the equine scholar and breed organizer John Wallace created his second registry for trotting horses (his first was for the American Trotter with a performance standard of 2:40 minute miles). But our passion for a fast trotter started earlier than this, and America formed its first trotting breed in 1818 when a three-minute mile standardbred had been set for the breeders, and it became a wildly successful breed not just here, but abroad. The new American Trotter went to England, Europe and even Russia where it won so handily that all other trotting breeds brought in our stock to improve their own speed and trot form.The importation of our American Trotter began in 1829 but by the late 1800s was being imported in huge numbers, and today the sport horse breeder will see their own American bloodlines behind many of the great sport horses of today--even the sacred Alme SF has some American Trotter in his background. It was the the speed--we had more of it. And it all goes back to the our first racehorse breed which was the carrier of the speed to all our stock. Plus our American Trotter and the pacing Running Horse were ridden race and sport horses, and were valued as Hunter Horses because all of them had a big jump and a calm disposition so they did not loose their head during the excitement of the chase. All of this happened before the Standardbred came into being. John Wallace opened a registry for the American Trotter in 1871 with a standard of a 2:40 mile. Then in 1879 he opened a new Register for those Trotters that could do the mile in 2:30 or less--this was the birth of the Standardbred.. Many of the entries in the new stud book were registered American Trotters, others came from the Running Horse, Canadian Pacer or Morgan Horse populations. 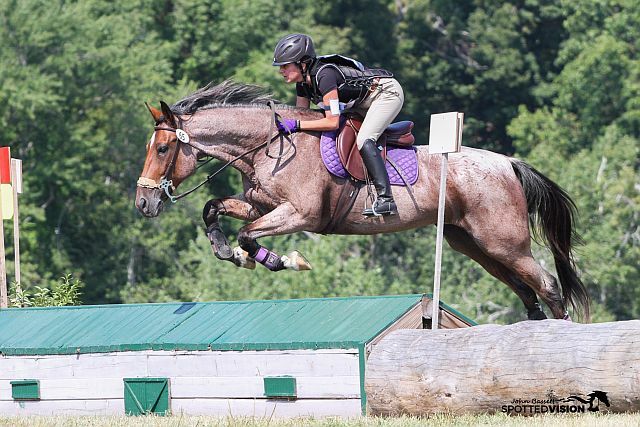 We usually use our Thoroughbred for the up-grader or base of our sport horse--it is traditional after all, but it is not our only choice and you can get the speed, stamina and athletic prowess from one of our other racehorses. And with the Standardbred you get the legendary temperament and soundness--they have the best feet and legs in the sport horse world. The skill and ability that the modern Standardbred has demonstrated in harness racing has eclipsed its saddle uses in our minds, but in the first half of the 20th century it was also shown as a combination horse, a gaited saddle horse and a "walk, trot, canter" horse in horse shows and was still widely used as a Hunter. In addition it was one of the chosen breeds from which the cavalry picked its breeding stock for the production of both the cavalry mount and its international sport horse. The greatest American three-day event horse was a little mare named Jenny Camp who won the individual silver and team gold medals in the 1932 Olympics and she came back in 1936 to take the individual silver again. Jenny was 3/4 Thoroughbred and 1/4 was Standardbred. This sport success was not a fluke as her full brother Don R was on the 1932 Olympic jump team. 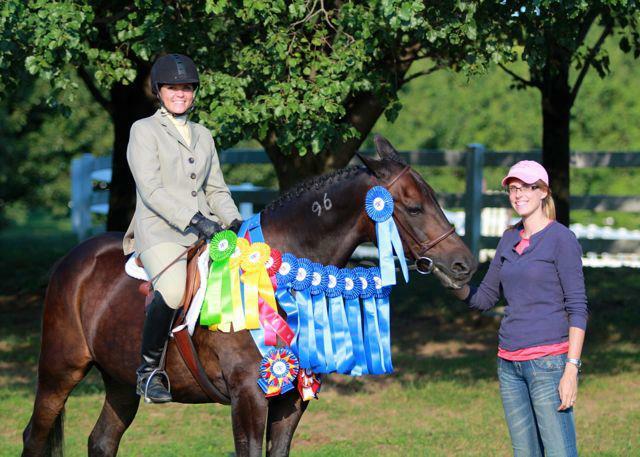 Standardbred mares were a top choice for crossing on the Remount Thoroughbred stallions. The trot and the pace are the intermediate gaits between the walk and the gallop. A horse can be 'dual-gaited', able to both trot and pace. Our original racehorse was gaited only--the trotting strains emerged with the addition of other bloodlines. For instance our New England Running Horse strain was called the Narragansett Pacer; its speed was timed in the early 1700s as pacing a mile in less than 2:30 minutes. Additions of the Colonial Dutch Cob into the breeding population produced a trot in some stains. There is no need to go into the full history of our colonial racing industry and the bloodlines it spawned here, plus there is not enough space for the in depth coverage needed; for that see Standardbred Sport Horses. The base breed components that made up the genetics of the Standardbred were the pacing and galloping branches of the Running Horse, the Canadian Pacer, Morgan Horse and the English Thoroughbred. New science on the 'gait-keeper' gene has hypothesized that the possession of this gene is a liability in most sport, Olympic type and racing too--the thought was that a horse that was homozygous for this gene did not and could not have a balanced canter--they even said it would be a poor jumper and surely could not do dressage well. The American breeds of Standardbred, Tennessee Walker and Missouri Fox Trotter are homozygous for this trait--which by extension means these breeds would also be poor candidates for a career in sport. Is this the reality? No, the Standardbred actually is one of the best or perhaps the best jumping breed out there, and the Tennessee Walker's normal gaits are a running walk and a canter and a counter canter and many are performing well in dressage, and the Missouri Fox Trotter is proving itself in jumping as well. Things are not always as they seem at first. And when I contacted the scientist leading these studies, and presented the evidence to the contrary, she explained that it was entirely possible for other genetic factors that are present in a horse or in an entire breed could alter completely what they theorized at first. A full discussion of this genetic factor and others like the speed gene and large heart gene will be found in Standardbred Sport Horses. The three horses pictured in this article are all homozygous for this trait, yet are winning everywhere they go in these disciplines. Recently, inspired by the racing career of Foiled Again, I began a study on soundness and the Standardbred, and from there it extended it to its sister breeds of Thoroughbred and Quarter Horse. The Standardbred appears to be more sound and resilient than the other breeds. So in what way are these harness racers a resource for the sport horse breeder? 1. They are a racehorse of the highest class and therefore can be a source of speed and impulsion for our sport horse recipe, and so then they can stand as a substitute for our Thoroughbred or used in conjunction with it. 2. They have retained the sweet temperament of our original Running Horse making them both a joy to work with and a suitable mount for the amateur. 4. They are extremely versatile and can be ridden as well as driven. 5. They are excelling at dressage, jump, event and driving today. Because of their success as a harness racer we have forgotten that until 1840 they were usually ridden in races, the pacers still were regularly ridden until the late 1800s. The pacing Running Horses are also part of the foundation stock of our talented saddle horse breeds. Next to the Thoroughbred and probably equal to it, the Standardbred carries the greatest amount of jumping traits then any other breed. This statement may seem crazy to you, but if you have ridden a Standardbred it wouldn't. And there is more to my statement, because I traced the jumping trait back through time to its root source, which turned out to be an early English Thoroughbred, and I discovered every successful jumping horse carries 'critical mass' in this horse in its background, and the best jumpers and the best producers of jumpers, that is, the jumper bloodlines all have strong pedigree focal points consolidating this talent--all this is laid out in Standardbred Sport Horses. In tracing this trait it became apparent that the Standardbred as a breed carries 'critical mass' in this trait as well. 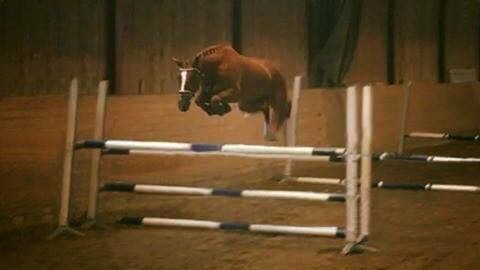 This should not surprise any of us who have been noting the breed's presence in some of the greatest jumpers or purveyors of jump. For example Galoubet A SF, who heads the greatest modern day European jump dynasty is 25% American Trotter. And of course there is Halla HE, the highest gold medal holder in Olympic jumping, and she is 50% Standardbred. As you can see it isn't just Olympic level competitors that have discovered the quality in the Standardbred, this breed has proven it is a perfect choice for the amateur also. Their agreeable disposition combined with their versatile athletic abilities make them a good choice for riders of any discipline, any age and any competition level. The jump in the Standardbred is a given, but what is surprising to me is that there is a tremendous dressage talent that travels down some of the Standardbred lines, many having a natural ability for the passage and the piaffe. Its close relative, the Saddlebred, also displays this ability in some lines. Here in the States you can contact a local Standardbred Pleasure Horse Society for help in finding a wonderful mount of your own. The horse below is another example. TC and his owner Kelly Marshall have enjoyed twelve years together, and finally after another successful season of showing in dressage, TC at age nineteen was retired. In 2010 the US Trotting Association proved how suitable the Standardbred is for all manner of ridden sport when it presented eight Standardbreds from across the country at the World Equestrian Games in Kentucky. These amateur competitors demonstrated the expertise they had achieved in their respective sports: driving of course, show jumping, eventing, dressage, hunter and western disciplines. Read about these wonderful horses and their talented owners here. 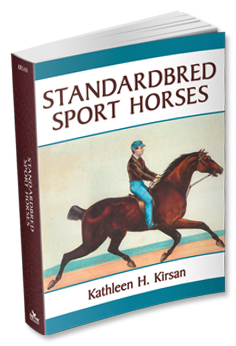 Standardbred Sport Horses is now available...order at 20% here.